Cross Stitch is very famous clothing brand for females. It has always provided something new to the customers every year. 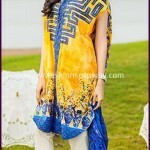 The clothing include stitched as well as unstitched clothes. For every season, Cross Stitch Spring Summer Lawn Collection 2015 introduces its new collection. Summer 2015 has arrived and Cross Stitch has launched its spring summer lawn collection exclusively for 2015. All of the designs are very unique and different from previous ones. The beautiful Pakistani model i.e. Marwa Hocane has shown her talent in the spring summer lawn collection 2015 of Cross Stitch. The colors used for the dresses are blue, pink, parrot, purple, orange, brown, white, light blue, yellow, light green and other bright colors. 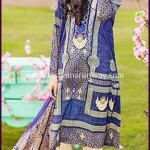 The collection is very classy and stylish containing stitched clothes, ready to wear as well as printed dresses. People are becoming fan of Cross Stitched clothes, buying dresses for themselves, for friends as well as for families as gifts. This brand also gives you the facility to buy online dresses. All of the information related with dress like its stuff, quantity of fabric, price and other description is displayed at the online store and home delivery service is also provided. The price range is very reasonable of Cross Stitch Spring Summer Collection 2015, unstitched three piece lawn suits with the combination of embroidered panels, prices around PKR 2000 to PKR 4500 (Pakistani rupees). The Cross Stitch Spring collection 2015 is available in every store nationwide. You can access the store or online shop as per your ease for buying the dresses. The embroidered dresses can be worn in the parties or formal occasions. There are some designs which are very simple and you can wear in casual days while other cannot be worn on informal occasions. Wear the Cross Stitch spring summer collection 2015 and be elegant!! 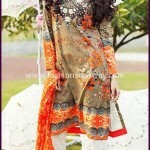 Check below here complete designs of Pakistani fashion brand Cross Stitch.